When it comes to using a table saw it only makes sense that you are as safe as you can possibly be every time you use it. 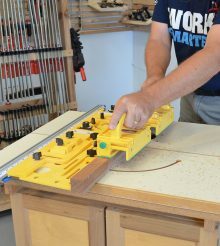 Now push sticks and push pads, when properly used, will make using your table saw a lot safer than using nothing at all, but these simple devices do have their limitations. So today I am going to have a real good look at the GRR-Ripper from Micro Jig and ask the question, is it worth adding to your tool collection? So, if you are new to woodworking and have never heard of the GRR-Ripper, what exactly is it? Well simply put, it is a sophisticated multi functioning push stick. It has taken the simple push stick and push pad, incorporated it into one device and then made some pretty innovative improvements to it. It’s uses are not only limited to safely working on a table saw, but can be used on a variety of other tools such as securely holding your material while you use a router table, resawing on a band saw and also for safely using on a jointer. the Micro Jig GRR-Ripper comes in two models. The GR-100 basic model and the GR-200 Advanced model. I’ll cover the features and differences between the two later but to start with I’ll look at the GR-100. Using your hands an fingers gives you amazing control when handling and supporting your workpiece. Unfortunately there is a huge risk of injury when you put your hands close to a spinning saw blade. The GRR-Ripper aims is to give you that security and control but at the same time keep your fingers well out of the way of a saw blade spinning at 4000 rpm. In the event that something does go wrong, I’d rather spend a few dollars on a new GRR-Ripper than an expensive trip to hospital. Micro Jig call the GRR-Ripper a 3 dimensional push stick. Downward pressure, eliminating kick back,. Sideways pressure, keeping the workpiece against the fence. Forward pressure. pushes both sides of the cut through the blade controlling both the good bit and the off cut. The GRR-Ripper essentially is a three footed push pad. Now normally, with a conventional push pad or push stick, the entire pad will pass to one side of the blade. If you want to make a thin rip, you can either use a push stick that passes between the blade and the fence, which is not very safe as you have very little control. Or you can reposition the fence and cut the other side of workpiece. This is safer, but inconvenient and potentially inaccurate as you would have to keep repositioning the fence after every cut. So how does the design of the GRR-Ripper help us here? The GRR-Ripper has two fixed feet on either edge and an adjustable foot in the middle which allows you to position it so it doesn’t strike the blade when making the cut. Each foot has a very grippy non slip foot, which securely holds the workpiece when pushing it through the blade. By having independent feet it allows the saw blade to pass down the middle of GRR-Ripper and the independent feet hold both the good piece and the off cut. The narrowness of the right had foot allows rips as narrow as 1/4″ to be made using the GRR-Ripper. There is an optional extra from MicroJig called the 1/8″ leg accessory, and yep you guessed it allows you to make cuts as narrow as 1/8″. This is something that you would find very difficult to do using conventional push sticks, but very easy with the GRR-Ripper. Another feature of the GRR-Ripper is the balance support. This simulates the support you experience from wider workpieces. Simply push the GRR-Ripper down onto your workpiece and adjust the balance support so it sits flush on the table. and tighten the adjusters. This eliminates the possibility of GRR-Ripper slipping on the workpiece. The handle on GRR-Ripper is adjustable so that can adjust the angle so that its comfortable for you. If you need to machine long pieces of timber on your table saw then a lot of people find it very useful to have two grippers. 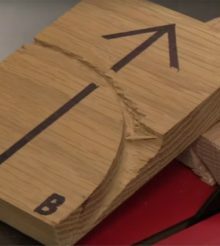 This means that you can push the work piece through the table saw hand over hand. The GRR-Ripper GR-200 Advanced Model is exactly the same as the basic model, but comes with the stabalizing plate and the adjustable spacer. If you have the basic model and want to the additional features of the advanced model, you’ll be pleased to know that the stabalizing plate and adjustable spacer are available separately. So you don’t need to purchase the whole advanced GRR-Ripper to benefit from these features. The stabalizing plate gives you 250% more surface stabalization area. It also acts like a feather board and can be used to push the bottom of the workpiece against the fence. The adjustable spacer gives you an extra 54% gripping area which helps with bigger workpieces. 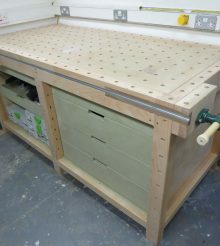 Now up until now we have looked at how the GRR-Ripper can make using a table saw safer. But it can also help you safely use a bandsaw. 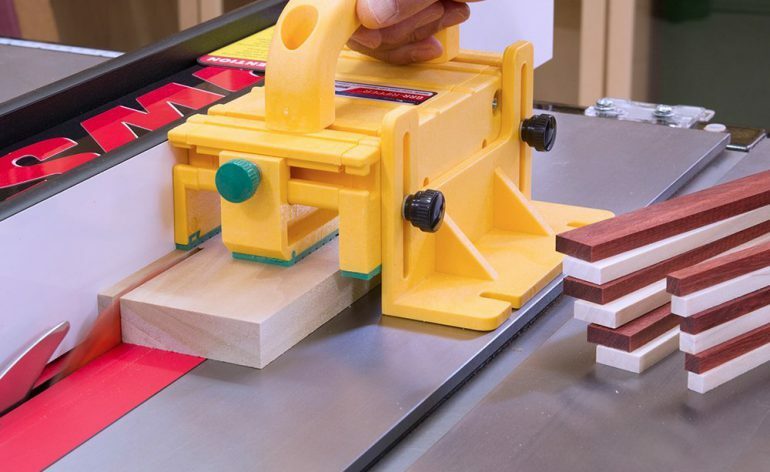 Use the GRR-Ripper to keep your fingers out of the way when you are using a jointer. You’ll also be pleased to know that you can purchase replacement parts for your GRR-Ripper should you damage them. Sorry to say I have one of these and it’s never gripped. Right out of the box it only sides across the wood. Sorry to hear this Rob, have you tried speaking to MicroJig?